Orphans and vulnerable children miss out on school enrolment, or have their schooling interrupted and/or perform poorly in school as a result of their situation. Expenses such as school fees, exam fees and school uniforms present barriers to school attendance. Please note you also have the option of making an annual payment for your sponsor child. You can also co-sponsor a child with Tariro House of Hope which means you will pay for the school fees while THH will pay for the uniforms & stationery, mandatory school reports and other school related costs like the schools registration fee which is required when placing a child in school. 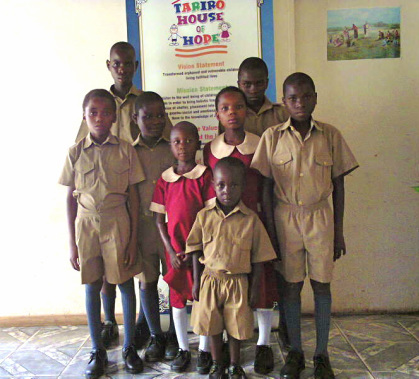 On March 24 2014 we managed to send 8 of our kids to a good primary school because of our wonderful sponsors! They are all wearing new uniforms and school shoes. The youngest is the boy in front we placed him in grade 0. After a dropping out of school due to school fees costs we were able to send 2 of our girls back to secondary school March 3rd 2014. On their first day back we sent them in borrowed uniforms but after we received funds from sponsors we bought them their very own, including the optional blazer because we want the best for them! Your sponsored child will write to you at least twice a year. To save on costs your letter from your sponsor child will be scanned & emailed to you. If you would like us to post the letter to you we ask you to provide the funds for the stamp and envelope.